Poompanmoung in his police chief days. Somyot Poompanmoung scooped up 62 of the available 72 votes from football clubs and officials, according to an AFP reporter. He was the frontrunner in a rowdy and often acrimonious campaign that brought to light massive public discontent with the game’s administrators in the football-mad country. Somyot, 61, was supported by a number of big Thai football clubs as well as his friend Vichai Srivaddhanaprabha, the billionaire owner of table-topping English Premier League outfit Leicester. He will succeed Worawi Makudi, a former FIFA insider and Thai football’s Teflon man who for years fended off endless scandals with lawsuits and bravado. Worawi, a FIFA executive committee member for 18 years until last May, could not run in Thursday’s election after being suspended by the game’s governing body over an alleged breach of its ethical code. 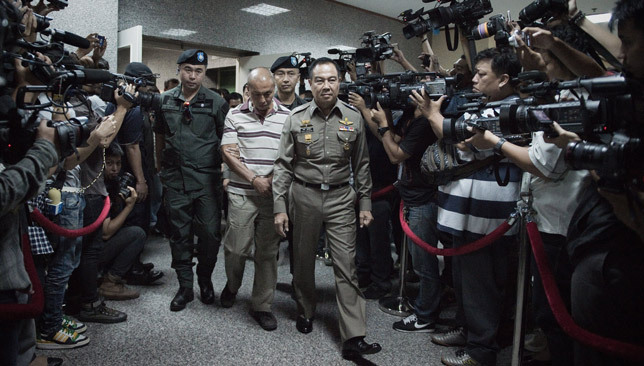 Instead Worawi is widely believed to have backed former Thai national team coach Charnvit Pholchivin, who on the big day received just four votes. There were mixed fortunes for the two Arabian Gulf League teams, while outfits from China, Japan and Uzbekistan all advanced to the next round. Eight games were played in total from both the East and West Asia zones, making up the final groups which will see its first fixtures played on 23 and 24 February. Which games stood out for you and how did your team get on? Comment below or use #360fans across social media to have your say. Xavi missed a crucial spot-kick. Al Jazira edged an epic play-off against Qatar giants Al Sadd on penalties to make the AFC Champions League group stages. A rollercoaster one-off contest high on incident but low on quality featured stupendous goals, awful defending, erroneous refereeing and a ballooned effort from visiting Barcelona and Spain legend Xavi prior to two-goal Hamza Sanhaji’s decisive rattling of the crossbar. The 5-4 win in the shootout at Mohammed bin Zayed Stadium came after a 2-2 draw which saw home hero Ali Khaseif save a Khalfan Ibrahim spot-kick in added time for the visitors after the 90-minute mark. A spot in Group C now awaits the jubilant Pride of Abu Dhabi, who have endured awful domestic form. “I think it’s an advertisement for football in the UAE, this game,” said coach Henk ten Cate. “I first want to congratulate my players – they did an amazing job. Opposite number Jesualdo Ferreira was magnanimous in defeat, yet believed the better team had been dumped out. He said: “I think we deserved to win this game. I think my players deserved to win this game and go to the Champions League – but congratulations for our opponent. “They [Jazira] made it work. They pressed in the second half and scored in the last minute of the first half. The players were granted a ticker-tape reception for this pivotal encounter. The heart-stopping action to come certainly justified the entrance, although uncertainty inflicted both from the start. For the hosts, relegation from the Arabian Gulf League remains a distant worry as coach Henk ten Cate attempts to fix the damage caused by the wretched decision to re-employ Abel Braga. 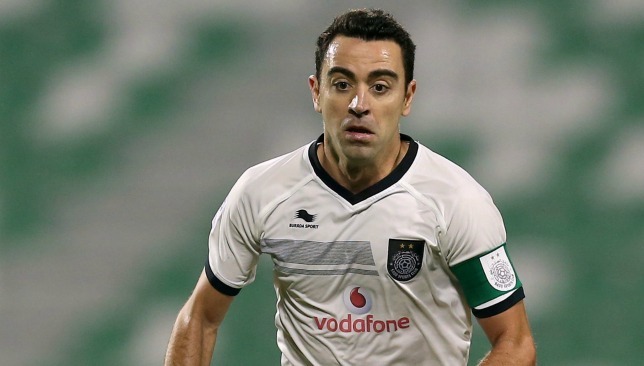 Al Sadd are traditional heavyweights, yet despite the summer acquisition of iconic midfielder Xavi they are an unassailable 19 points behind runaway Qatar Stars League leaders Al Rayyan in fourth. Unsurprisingly, an error was to blame for the opener. Jazira right-back Khalid Sabeal – soon hooked by his furious boss – was careless in the extreme when he passed backwards from the halfway line straight to the grateful Senhadji, who slotted underneath advancing UAE No.1 Khaseif with aplomb. At this stage, Xavi’s calm and the able assistance of Algeria utility man Nabil Belhadj threatened to take the game away. But Al Zaeem reciprocated the gift just before the interval to allow Jazira back into the decider. A short corner from Brazil playmaker Thiago Neves picked out giant target man Kenwyne Jones, whose glancing header was unfathomably allowed to creep in by leaden-footed goalkeeper Saad Al Sheeb. The momentum was now with the UAE outfit. Neves shot tamely at Al Sheeb when played in from a counter-attack, before Makbhout put them ahead in style. The UAE forward took his time standing over a free-kick on the edge of the penalty box, justifying the delay with a delicate effort which floated into the top corner to spark jubilation on the sidelines. Jesualdo Ferreira’s visitors were reeling, a repeat of the epic penalty win against Al Wahda during their trip to Abu Dhabi at the same stage last year a distant possibility. But Jazira’s penchant for self-implosion was to re-appear. Sanhaji smashed into the roof of the goal to level on 88 minutes after centre-back Abdullah Mousa was caught under a high ball, elimination then seemingly inevitable once replacement right-back Sultan Al Suwaidi hacked down superstar substitute Ibrahim in added time just outside the box only for referee Ravshan Irmatov to incorrectly award a penalty. The Qatar playmaker – afflicted by niggling injury this term – saw off Wahda but his weak effort down the middle was palmed away by the grateful Khaseif. Extra-time flashed by in a blur of poor pot shots, UAE centre-back Fares Juma then heading agonisingly over at the death to ensure a penalty shootout. It then all came down to Senhaji after key prior misses from Xavi and Neves, with the 21-year-old hitting the crossbar to spark an explosion of joy from Jazira.